Please forgive the delay in posting info and pictures about the first hunt of 2014. I have many excuses if you are interested, the reasons however include poor internet and no time to post. Below was written after arrival – there will be more to follow. 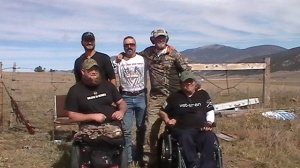 The hunters, all wounded in service to their country, began to arrive on Thursday Oct.16 around 5:30 pm. Will, retired Navy injured in an accident while loading ordinance about the USS Nimitz and Alex, an airborne ranger injured while sent by his Commanding Officer to retrieve a member of his group, arrived first. Colton, served in the air force and was injured during routine surgery by medical error arrived about 6:30 pm. Roland, was as he put it “shot up” 3 days before the Blackhawk down incident in Mogadishu, arrived about 8:30 pm. These men are hosted on this hunt by a variety of men and women – many of whom took time off from their work to come and serve these true American heroes. Friday morning, after sleeping in to allow for some recovery from travel and a late breakfast, all went to some local folks ranch to check their rifles. After the rifle check, there was time for a brief ride around in the areas to be hunted. Friday evening is party time. It was estimated that more than 65 people came to dinner to provide an evening of appreciation for these men who have literally sacrificed a big piece of their life and limbs. By way of reminder, there were no wounded warrior programs when Roland came home from Mogadishu. As John put it, when 65 citizens of the Moreno Valley in New Mexico gave these true American heroes a standing ovation there was not a dry eye in the room. In fact, mine are not dry just remembering. These men truly sacrificed for their country. 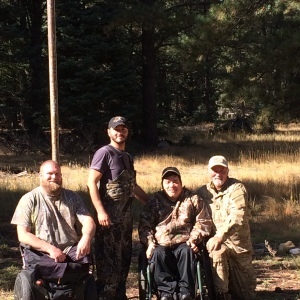 In the picture above of the 4 hunters there is one working leg. Gifts for the veterans were provided by New Mexico Propane of Taos, a division of Amerigas, and Urban Interface Solutions of Taos – a company who clears trees around homes in the forest and generally works to keep the local area forests healthy. The New Mexico Girl scout council allowed for the use of their dining hall for the dinner and for “camping” for the hunters. 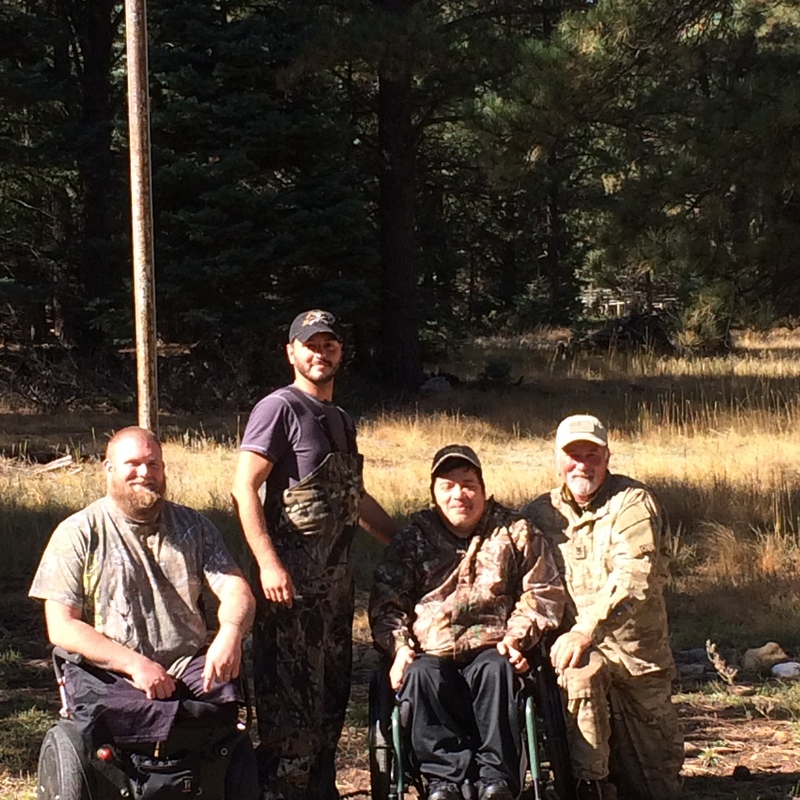 After two days of good solid hunting there were no elk harvested, but I will say that a grand time with many new adventures and experiences was had by all – and by all I mean the veterans and their hosts. These events are not possible with a lot of volunteer help. We have 7 men serving 4 veterans and 4 ladies who are serving full time cooking, cleaning, and providing for any need of anyone involved.I assure you without the people like Alan, Rick, Terry, Rick, John, Michael, Pam, Cheryl, Bobbi Jean and Patty this would not have been possible. Will had an up close and personal experience with a bull elk on Sunday morning. He and Alan, his host, were surprised when a bull came within 25 yards of them. No noise, no calls, no brush cracking, a nice 5X5 “just appeared” according to Will and Alan. But, before Will could get ready the elk “ walked out of his life forever” according to Will. Colton, with Michael and Rick his hosts, had several bulls bugling, screaming, grunting, and generally interested in the cow elk that was making sounds near them. And by cow elk, I mean the calling done by Michael and Colton. The buglers hung up in the trees and never appeared, but “ it was quite exciting to hear them scream and come closer, “ according to Colton. The hunt continued in the rain Sunday evening and Monday. Stay tuned and thank you for your prayers. I can honestly say, this our 3rd year and 5th hunt has been the most exciting this early in the hunt and the camaraderie and relationships have melded together faster than ever.